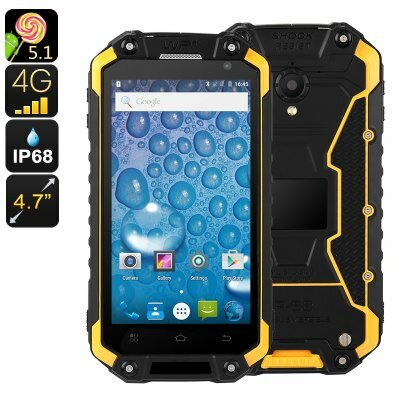 Successfully Added Rugged Android Phone Jeasung X8G - IP68, Dual-Band WiFi, Quad-Core CPU, 2GB RAM, Dual-IMEI, 4G, OTG, NFC, HD Display (Yellow) to your Shopping Cart. The Jeasung X8G rugged smartphone will keep you connected anywhere you go. Thanks to its durable IP68 design, this Android phone is fully resistant to water, drops, and dust. This makes the Android smartphone perfect for outdoorsmen and people that work in rough environments. Thanks to its low price tag, this cheap Android phone offers an affordable way for you to stay within reach to friends and family. It runs on the Android 5.1 operating system that lets you enjoy all the basic Android features. This means you’ll be able to play games, tackle mobile Apps, and enjoy movies at any given moment. No matter what type of smartphone user you are, this cheap Android phone is sure to meet your demands. On its 4.7-Inch display, this rugged smartphone lets you enjoy all media in crisp HD resolution. This beautiful display features IPS technology, thus letting you enjoy vivid color and high details no matter your viewing angle.The cell phone comes packed with a 4000mAh battery that brings along countless hours of usage time. Thanks to this, you’ll be able to keep yourself entertained with media throughout the day. With this Android phone at your side, you won’t have to worry about recharging your device. The phone’s 16GB internal memory and 128GB SD card slot offer plenty of storage for you to keep all your media. From now on, you’ll always be able to enjoy your favorite movies or play the latest mobile games. With its Two-IMEI numbers, this rugged Android phone will keep you connected no matter where you are. By allowing you to be reachable on two phone number simultaneously, it brings along great efficiency for those of you that wish to separate work and private life. Even further increasing your overall connectivity is the phone’s 4G and Dual-Band WiFi support. You’ll be able to browse the web at lightning speeds no matter where you are. This allows you to make online calls, stream movies, and browse the web at any given moment. Whether you’re at home or abroad, with this Android smartphone you’ll always be within reach for friends and family. Within its rugged body, this Android phone packs a sophisticated Quad-Core processor and 2GB RAM. Together, this hardware can tackle basic software and games without dropping a frame. At the rear, your smartphone packs an 8MP camera. With this piece of equipment at your side, you’ll always be able to shoot stunning photographs of all your upcoming holidays and adventures. This rugged smartphone comes with a 12 months warranty, brought to you by the leader in electronic devices as well as wholesale electronic gadgets..